An extensive study of the book of Acts. We look at the places mentioned in Acts, taking them in alphabetical order. Each place is located on a map and then we note the people and events associated with that place. Quizzes are included. We also study the whole book verse by verse. Tap any title next to an arrow in the list below. ➤ The Spread of Christianity —Introduction to the Acts Facts series: The Spread of Christianity and the six parts of the book of Acts. ➤ Paul's Journeys —Summary of the journeys and periods of the apostle Paul. Traditionally, Paul is said to have made three missionary journeys, plus a fourth journey to Rome. ➤ Achaia to Antioch —Maps and Info about Achaia, Adramyttium, Adria, Alexandria, Amphipolis, and Antioch. ➤ Antipatris to Azotus —Maps and Info about Antipatris, Apollonia, Apii Forum, Arabia, Asia, Assos, Athens, Attalia, and Azotus. ➤ Berea to Cilicia —Maps and Info about Berea, Bithynia, Caesarea, Cappadocia, Cape Salmone, Cenchrea, Chios, and Cilicia. ➤ Clauda to Cyrene —Maps and Info about Clauda, Cnidus, Coos, Corinth, Crete, Cyprus, and Cyrene. ➤ Damascus to Fair Havens —Maps and Info about Damascus, Derbe, Egypt, Ephesus, Ethiopia, and Fair Havens. ➤ Galatia to Judea —Maps and Info about Galatia, Galilee, Gaza, Iconium, Illyricum, Dalmatia, Italy, Jerusalem, Joppa, and Judea. ➤ Lasea to Media —Maps and Info about Lasea, Libya, Lycaonia, Lycia, Lydda, Lystra, Macedonia, and Media. ➤ Melita to Olivet —Maps and Info about Melita, Mesopotamia, Miletus, Mitylene, Myra, Mysia, Nazareth, Neapolis, and Olivet. ➤ Pamphylia to Phonecia —Maps and Info about Pamphylia, Paphos, Parthia, Patara, Perga, Pergamum, Phenice, Philadelphia, Philippi, Phoenix, and Phonecia. ➤ Phrygia to Rome —Maps and Info about Phrygia, Pisidia, Pontus, Ptolemais, Puteoli, Rhegium, Rhodes, and Rome. ➤ Salamis to Smyrna —Maps and Info about Salamis, Samaria, Samos, Samothrace, Sardis, Saron, Selucia, Sidon, and Smyrna. ➤ Syracuse to Tyre —Maps and Info about Syracuse, Syria, Sirtis, Tarsus, Thessalonica, Three Taverns, Thyatira, Troas, Trogyllium, and Tyre. ➤ PDF eBook (1) Places —All lessons and quizzes above in pdf 8.6mb. ➤ Preface to Studies in Acts —Introduction and overview of the verse by verse exposition of Acts of the Apostles. 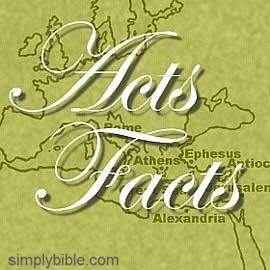 ➤ Acts 1:1-8 —A verse by verse study of Luke's introduction to the book of Acts. ➤ Acts 1:9-14 —A verse by verse study about the ascension of Christ, and the return of the disciples to Jerusalem. ➤ Acts 1:15-26 —A verse by verse study of how Judas the betrayer, who had committed suicide, was replaced by Matthias. ➤ Acts 2:1-13 —A verse by verse study of how the apostles received power through a baptism of the Holy Spirit. ➤ CHART Acts 2:14-39 —An outline study of Peter's sermon on the day of Pentecost. ➤ Acts 2:14-36 —A verse by verse study of Peter’s sermon in Jerusalem on the day of Pentecost following our Lord’s ascension. ➤ Acts 2:37-47 —A verse by verse study of how the first church of Christ was established in Jerusalem on the day of Pentecost following our Lord’s ascension. ➤ Acts 3:1-11 —A verse by verse study of the healing of the man born lame, a miracle Peter and John did at the temple gate. ➤ Acts 3:12-26 —A verse by verse study of Peter’s message after healing the man born lame. ➤ Acts 4:1-22 —A verse by verse study of how the religious rulers of Jerusalem tried to stop Peter and John from preaching after the healing of the man born lame. ➤ Acts 4:23-37 —A verse by verse study. These verses describe the disciples’ prayer and encouragement after Peter and John’s release from custody. ➤ Acts 5:1-16 —A verse by verse study about the lie told by Ananias and Sapphira, and the miracles done through the apostles’ hands. ➤ Acts 5:17-42 —A verse by verse study. These verses describe how the apostles were arrested and jailed but miraculously escaped and kept on preaching Jesus. ➤ Acts 6:1-15 —A verse by verse study. These verses describe how seven men were chosen as special ministers, and one of them, Stephen, fell foul of the authorities. ➤ Acts 7:1-19 —A verse by verse study. These verses describe Stephen’s narrative of Israel’s history from Abraham to Moses. ➤ Acts 7:20-41 —A verse by verse study. These verses describe Stephen's narrative of Israel's history during the time of Moses. ➤ Acts 7:42-60 —A verse by verse study. These verses describe Stephen’s rebuke to the Sanhedrin and his death at their hands. ➤ Acts 8:1-25 —A verse by verse study. These verses describe Philip s evangelism in Samaria and the conversion of Simon the sorcerer. ➤ Acts 8:26-40 —A verse by verse study. We look at the account of Philip converting the man from Ethiopia who was riding in his chariot. ➤ Acts 9:1-19 —A verse by verse study. This passage is about the conversion of Saul with the assistance of Ananias. ➤ Acts 9:20-31 —A verse by verse study. These verses describe Saul’s first experiences as a disciple of Christ. ➤ Acts 9:32-43 —A verse by verse study looking at Peter’s Miracles in Lydda and Joppa. Peter healed a paralyzed man and raised Tabitha from death back to life. ➤ PDF eBook (2) Acts 1:1 to 9:43 —All verse by verse lessons in Part 1 in pdf 9.6mb. ➤ Acts 10:1-23 —A verse by verse study. These verses are about two visions, one experienced by the good man Cornelius, and the other by the apostle Peter. God prepares these two men, a Gentile and a Jew, to meet each other. ➤ Acts 10:24-33 —A verse by verse study about Peter the apostle going, by God’s directive, to the house of Cornelius a Gentile. ➤ Acts 10:34-48 —A verse by verse study of Peter’s preaching to Cornelius and his household, and the falling of the Holy Spirit upon them. ➤ Acts 11:1-18 —A verse by verse study of Peter’s own account of the Conversion of Cornelius. Through Peter’s eyes we get some extra insights. ➤ Acts 11:19-30 —A verse by verse study of the establishment of a new church in Antioch Syria, and the involvement in this work of Paul and Barnabas. ➤ Acts 12:1-17 —A verse by verse study. These verses describe James’s death, Peter’s imprisonment and escape. ➤ Acts 12:18-25. —A verse by verse study. These verses describe events after Peter’s escape from prison. Herod is eaten by worms and dies. ➤ Acts 13:1-12. —A verse by verse study. Paul’s first missionary journey begins, and he strikes Elymas the sorcerer blind. ➤ Acts 13:13-42. —A verse by verse study. Paul’s speech in the synagogue at Antioch in Pisidia. ➤ Acts 13:43-52. —Paul and Barnabas are persecuted in Antioch Pisidia, and driven out of the city. ➤ Acts 14:1-18. —About how Paul and Barnabas were persecuted in Iconium, and mistaken for gods in Lystra. ➤ Acts 14:19-28. —These verses describe how Paul was stoned by opponents in Lystra. ➤ Acts 15:1-12. —These verses describe how Paul spoke to the council at Jerusalem regarding the error of the Judeans. ➤ Acts 15:13-31. —A record of James’s speech to the council at Jerusalem regarding the error of the Judeans. ➤ Acts 15:32-41. —The beginning of Paul’s second missionary journey gets off to a shaky start. ➤ Acts 16:1-15. —These verses describe Paul’s second missionary journey as far as Philippi, and the conversion of Lydia. ➤ PDF eBook (3) Acts 10:1 to 16:15 —All verse by verse lessons in Part 2 in pdf 7.6mb. ➤ Acts 16:16-40. —These verses describe Paul’s experiences and work with Silas in Philippi, including the conversion of the Philippian jailer. ➤ Acts 17:1-15. —about Paul’s experiences and work in Thessalonica and Berea, with Silas and Timothy, during his second missionary journey. ➤ Acts 17:16-34. —about Paul’s experiences and work in Athens, especially his speech to the philosophers in the Areopagus. ➤ Acts 18:1-17. —These verses describe Paul’s work in the city of Corinth, tentmaking and preaching, and the fiasco when the Jews brought Paul to trial before Gallio. ➤ Acts 18:18-28. —Records the completion of Paul’s second missionary journey. There is also a brief account of Apollos’s gospel work. ➤ Acts 19:1-20. —These verses describe Paul’s experiences and work in Ephesus during his third missionary journey. Includes an account of Paul’s miracles and the burning of magic books. ➤ Acts 19:21-41. —These verses describe Paul’s troubles in Ephesus with the followers of the goddess Diana, also known as Artemis. ➤ Acts 20:1-16. —These verses describe Paul’s week in Troas and his return to Macedonia and Greece during his third missionary journey. ➤ Acts 20:17-38. —These verses record Paul’s farewell speech to the Ephesian elders. ➤ Acts 21:1-17. —These verses briefly describe Paul’s journey from Miletus to Jerusalem, as his third missionary journey draws to a close. ➤ Acts 21:18-40. —These verses describe Paul’s troubles in Jerusalem at the end of his third missionary journey. ➤ Acts 22:1-30. —These verses record Paul’s speech to a hostile crowd in Jerusalem. ➤ Acts 23:1-35 —These verses describe how the Sanhedrin persecuted Paul in Jerusalem, and the Roman commander Lysias rescued him. ➤ Acts 24:1-27. —These verses describe how Paul was examined by Felix in Caesarea with Tertullus and the Jews accusing Paul. ➤ Acts 25:1-27. —These verses describe how Paul was examined by Festus and Agrippa in Caesarea..
➤ Acts 26:1-32. —These verses record the speech that Paul made to King Agrippa. ➤ Acts 27:1-44. —These verses describe Paul’s journey from Jerusalem toward Rome, the storm at sea and shipwreck on Malta. ➤ Acts 28:1-31. —These verses describe Paul’s stay on Malta, the journey from Malta to Rome, and a little of his work in Rome. ➤ PDF eBook (4) Acts 16:16 to 28:31 —All verse by verse lessons in Part 3 in pdf 8.8mb. Every lesson is available individually in a pdf version. Just use the pdf link at the end of any lesson. However all lessons are also collected into four ebooks in pdf. Use the links below to access these. —You can download/save a pdf document with all the lessons about places in Acts, complete with maps. The size of this file is 8.6 megabytes. Tap the title next to the arrow to get that document. —You can download/save a pdf document with all the verse by verse lessons in Acts Facts Part Two, from chapter 1 through the first half of chapter 9. The size of this file is 9.2 megabytes. Tap the title next to the arrow to get that document. —You can download/save a pdf document with all the verse by verse lessons in Acts Facts Part Three, from the middle of Acts 9 to the first half of chapter 16. The size of this file is 7.6 megabytes. Tap the title next to the arrow to get that document. —You can download/save a pdf document with all the verse by verse lessons in Acts Facts Part Four, from the middle of chapter to the end of Acts. The size of this file is 8.8 megabytes. Tap the title next to the arrow to get that document.